Fruit Warp might be one of the oddest slots we’ve played in a while but that’s what makes it great. Match up three or more fruit in the void and win big. 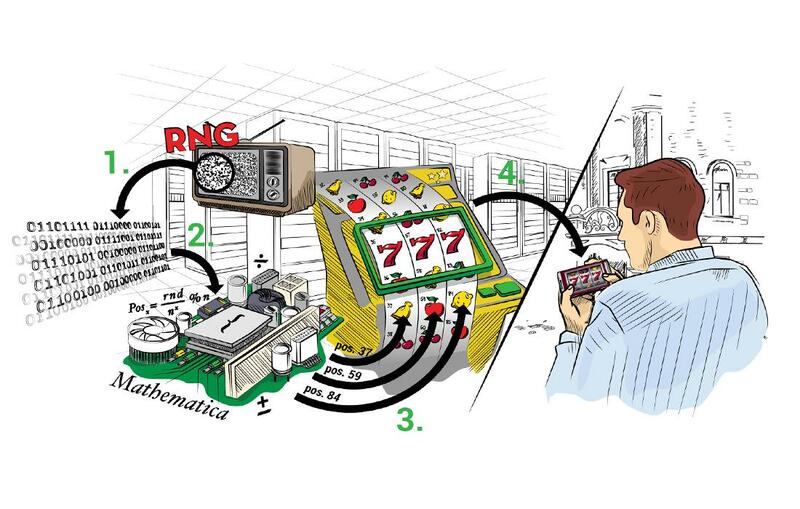 With a medium volatility and an RTP of 97%, this might be the game for you. Fruit Warp’s not your average slot. It does away entirely with the whole reel or grid structure, it has no cutesy characters or complex bonus games. Instead, it features an eerie, but strangely beautiful void from which 9 pieces of fruit emerge as if flung out by the eldritch greengrocer of the abyss. What bizarre mind constructed this, we don’t know. But it is hard not to fall immediately for its simple and elegant mechanics and visuals. 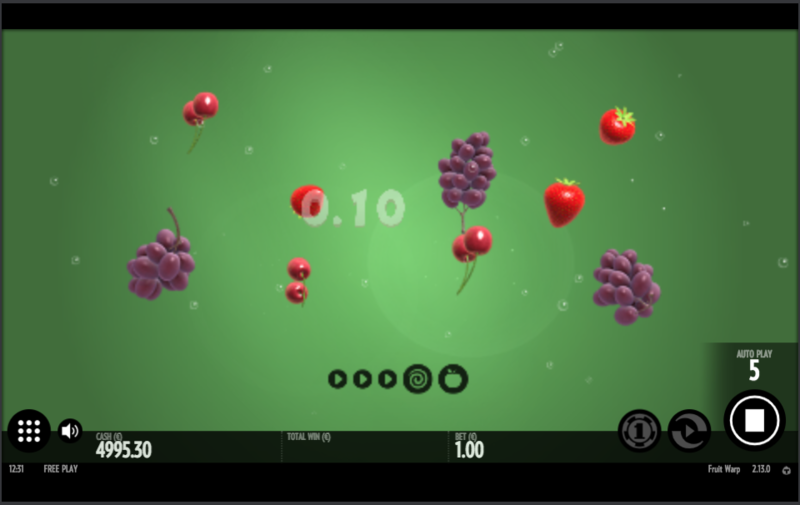 The game is 3D modelled in a way that allows the fruit to come arcing up at you in a lazy parabola. Once they arrive in front of you they spin slowly in place until warped out of existence by the next spin. The sound design is basic, with a slightly annoying marimba track you might want to mute if you’ll be playing for a while. But in all other ways, the game takes full advantage of the Thunderkick slot software. 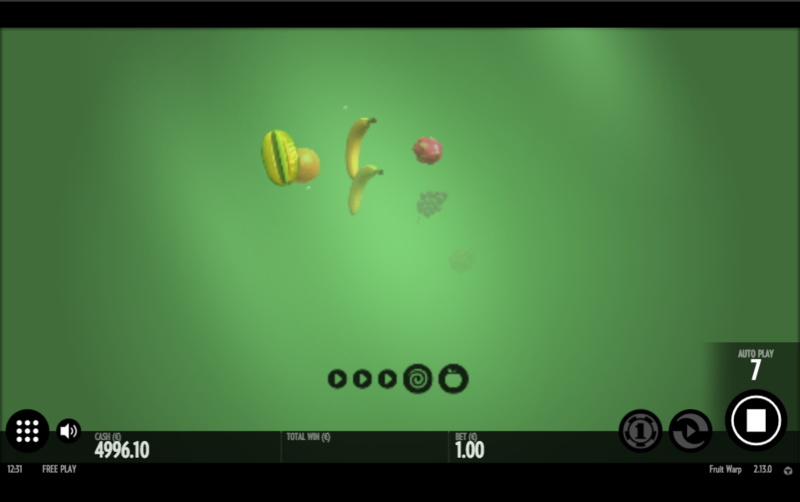 As described above the gameplay the game throws a random selection of nine fruits at you rather than dealing with reels and symbols on a grid. 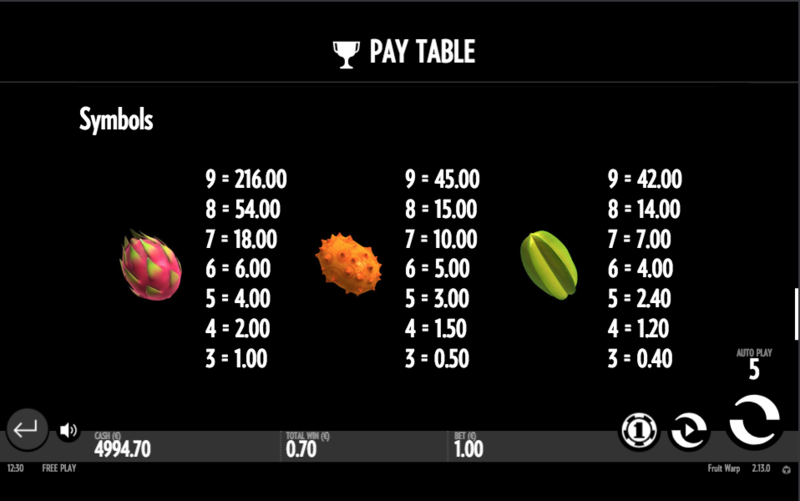 If you hit three or more of the same fruit the game pays out. If you manage to hit four of the same kind of fruit a portal zaps the other fruit out of existence and triggers a respin of those fruit. Hit five or more and you trigger one of the fruit mode bonuses. 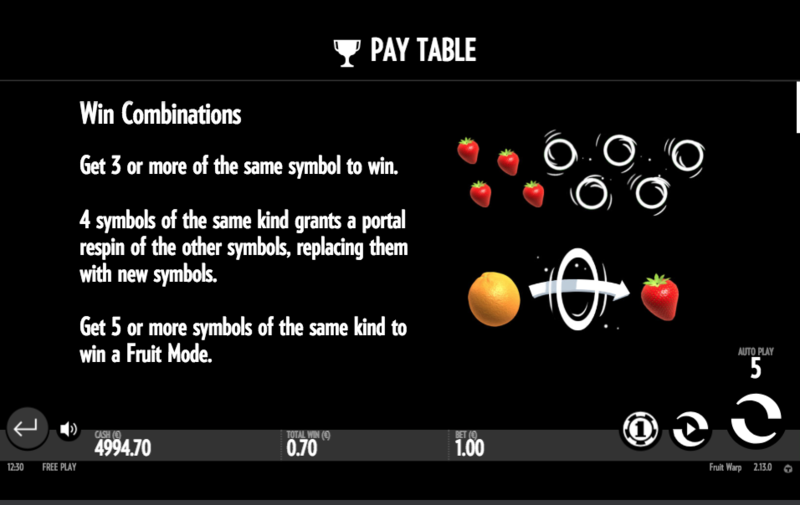 Each fruit mode is a slightly different set of bonuses and multipliers that are triggered when you hit more of the same kind of specific fruit. 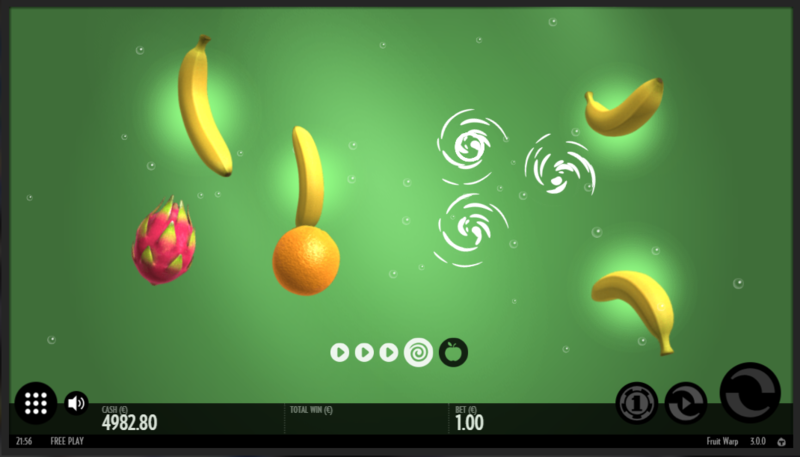 The game continues until a spin happens without the fruit mode’s specific fruit appearing. 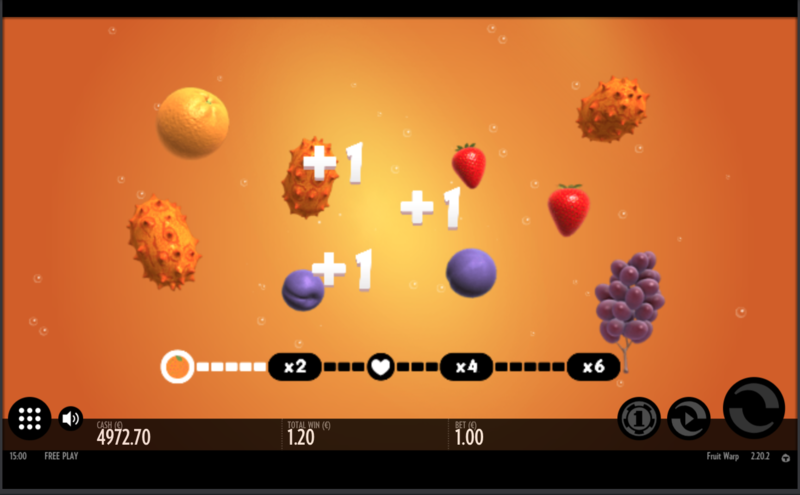 In each fruit mode every time you hit one of the mode’s fruit you earn a combination of lives, which allow you to ignore a spin where there are none of the specific fruit, and multipliers which are applied to your total win at the end of the bonus feature. 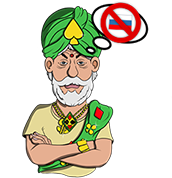 Each type of fruit provides a different combination of lives and multipliers with the rarest fruit giving the best rewards during bonuses. As well as its visual appeal the game has a relatively low vig of 3% which is attractive enough and goes well with the medium-level volatility of the game. 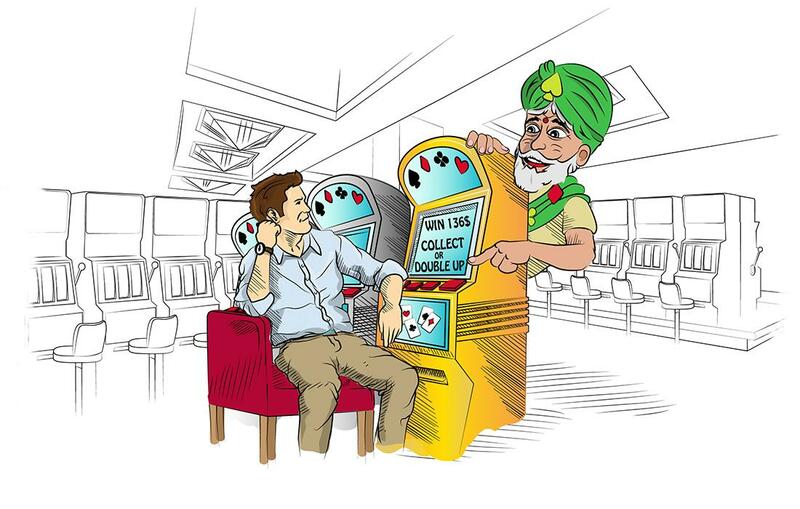 The range of bets is not bad £/$/€0.10 to £/$/€100 per spin. Obviously, without win lines, there is no way to manipulate volatility nor to affect bet size more subtly than by simply changing the coin size. For anyone looking for a medium volatility slot, this can be strongly recommended with its decent RTP (97.0%) and innovative style and gameplay. This slot is great fun.